Info Dentist Dr. John Logan Cashin, Jr. was born on April 16, 1928 in Huntsville, Alabama to Grace Brandon Cashin, a school principal, and Dr. John Logan Cashin, Sr., a dentist. Cashin was a precocious youth who started kindergarten at the age of three. He and his older brother, who were always in the same year at school, were co-valedictorians of their Alabama A&M High School graduating class. Cashin decided to become a dentist, like his father. He spent two years at Fisk University and then attended Tennessee State University. Cashin then received his D.D.S. degree from Meharry Medical School in 1952. Immediately after Cashin graduated from medical school, he was drafted into the U.S. Army, where he was made a first lieutenant and Chief of Dental Services for soldiers stationed near Fountainebleu, France. While in France, Cashin became familiar with a number of black American expatriates, including writer Richard Wright and the Chicago Defender's Ollie Stewart. 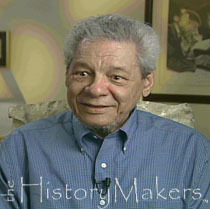 After two years in the Army, Cashin returned to the United States, where he became active in the Civil Rights Movement. In 1967, he helped found the National Democratic Party of Alabama (NDPA) and was elected as the organization's first party chairman. He led a delegation to the Democratic National Convention in 1968, challenging the representative nature of the regular delegation and its loyalty to the national Democratic Party. Cashin once ran for Mayor of Huntsville, and in 1970, he was the NDPA's candidate for governor, running against George Wallace. He received more than 16 % of the votes in that election. Between 1968 and 1974, the NDPA facilitated the election of more than 100 blacks to public office in Alabama. In 1974, the Alabama Democratic Party surrendered and integrated their ballot. Cashin resides in Washington, D.C.